Tales of Mommyhood: The Watch - available today! 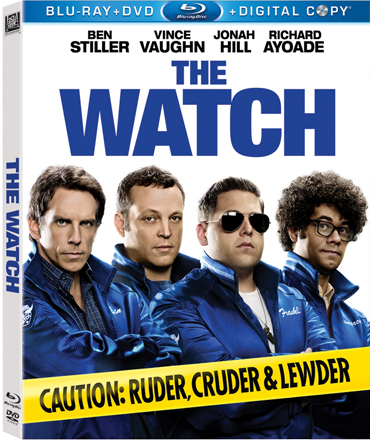 The Watch - available today! Out on Blu ray and DVD today - I haven't had a chance to see The Watch yet myself, but I am definitely looking forward to it! The WatchBen Stiller, Vince Vaughn, Jonah Hill and Richard Ayoade take male bonding to hilarious new heights in this outrageous, no-holds-barred comedy that gets funnier every time you watch! There’s trouble brewing in peaceful Glenview, Ohio. That’s why four civic-minded citizens, armed with flashlights, walkie-talkies and spiffy new jackets, have teamed up to safeguard their community. But the guys find more than they bargained for when they uncover an alien plot to destroy Earth, and now these bumbling heroes are Glenview’s only chance to save the neighborhood — and the world — from annihilation. This looks hilarious! Will definitely check it out. With a cast like that, it's gotta be a funny movie! I'll have to watch this one for sure! Looking forward to see this... I love anything Ben Stiller is in!